Cable Cutting Fall 2015 – Goodbye Media Center, Hello Tablo! The year was 2003, and frustrated by the terrible state of cable boxes I rushed out to the store and bought one of the very first Windows Media Center home theater PCs. I went deep: tweaking and hacking, community support on message boards, ultimately being invited out to Redmond several times to work with the product team. Media Center was awesome, but didn’t get the traction it deserved and effectively the platform died after the last major release in Windows 7. Since that time, I’ve kept my own Media Center setup going because frankly there still wasn’t anything better available in the market. In the summer of 2014 I came across a little startup in Ottawa called Nuvyyo who had come up with a new concept in their Tablo over-the-air PVR. I visited the office, met with the CEO, and picked up one of their boxes that makes over-the-air broadcasts as simple as using Netflix. For a full year I ran Media Center and Tablo in parallel, stayed in touch with the company via their active community page, and rode the wave of rapid iterations as a beta tester. Last week with the new fall TV season approaching, I finally wiped my old Media Center PC and have put it to new use as a Windows 10 PC. I am so very close to the goal that I set for myself back in 2011 to cut the cable while still ensuring that content creators get paid. Put another way – I don’t want to pay for a ridiculously over-scoped cable package, but at the same time I don’t want to steal content. Tall order. Today I am happy to report that my entire family can very easily record all of the network television they want and get access to it on any TV in the house or any mobile device anywhere in the world via Tablo. We can watch every Blue Jays game from anywhere (which in 2015 is a definite must-have) via MLB.TV. We can get access to thousands of movies and television shows through Netflix, and we can rent first-run movies whenever we want through the many different services on Roku. The only real gap here is that we aren’t always online, and I’ve had to hack my way around that a little bit so I can have access to the content I’ve paid for when disconnected – in an airplane, on a road trip with the kids, in a hotel with terrible wifi. Tablo Ripper pulls recordings off of the Tablo, PlayOn downloads video for personal use from Netflix and other streaming sites, and the iPad app Infuse makes it super-easy to take that content with me when I’m off the grid. My old Media Center PC has been repurposed to act as the hub for my offline tools where it collects and consolidates as much of the content possible for offline use. We’re getting close, but we are still living in a world of content silos. Content owners are finally opening up to the idea of letting people have access to what they want when they want, but they’re all fighting to be the one place where you go to get that content. That’s never going to happen, and they’ll wake up to it eventually but for now it’s a hunt-and-peck universe for us consumers and sadly yes it is still easier to steal content than it is to pay for it. I have a glimmer of hope that the new Apple TV will start to pull some of this together finally through universal search, but it’s a faint glimmer to be honest. Here’s hoping that the trend continues: that I will be able to pay for the content that I want, that it will become easier to access and consume that content, and that eventually it will be easier to pay for content than it is to steal it. 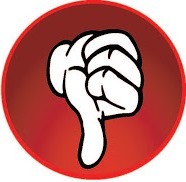 It’s that time of year, when the broadcast TV industry showcases their latest wares and we the general public get to play a massive game of “hot or not”. Inevitably there will some winners, many losers, and some shows that fall in the middle. In our household, the annual event ends in new series that get a coveted spot on the PVR for one of either myself, Jodie, or sometimes both of us to watch. Those that end up currying favour with only one of us go into the “when Pete’s on a plane” rotation. My coworker Paul insisted, I say again insisted, that I post the ongoing results to the blog. 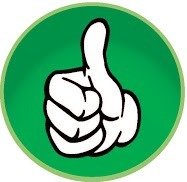 Hover over the thumbs for short commentary. – Yeah, that’s not happening. Delete! – This could be a keeper! This is the conclusion of a blog series on cutting the cable in Canada. Back in the spring, I began to look at options for cutting the cable in Canada, including IPTV, Apple iTunes, Netflix, TV Websites, Boxee, and a brief look to see if the grass is any greener south of the border. I’ll admit that after the initial review I got somewhat dismayed because the conclusion was leaning to “not possible in Canada”. The biggest sticking point was content for my kids, six and eight year old girls who enjoy watching Teletoon and some other kid-oriented cable channels on a little TV in the basement. I decided to throw in the towel. Cable had won. However, this summer my cable provider gave me an extra push by removing all of the kids channels from their analog tier which meant that cartoons would no longer work on the little TV downstairs without additional investment. This was the time to strike! 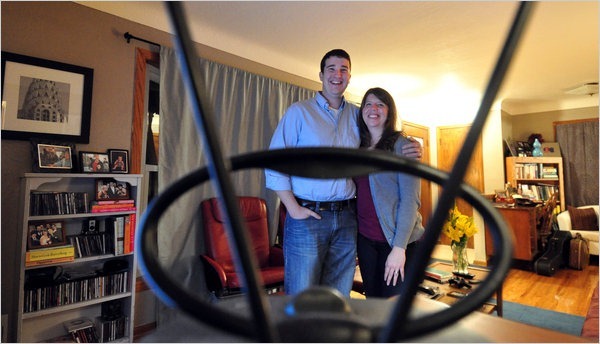 A small antenna in the attic drives the majority of what we watch in the house. I ran the coax cable from my antenna down into my basement, literally unplugged the cable feed from the road and instead plugged the antenna into the splitter, and now every room in the house how has HD antenna. Plug in an HDTV, and about 35 channels come in crystal-clear. So now I had all the TVs in the house running free and legal live TV, but what I really wanted to do is record that TV to a PVR so I can watch it anywhere in the house. To do this, I activated the free Windows Media Center program that comes with Windows 7 to turn my Windows PC into a fully functional PVR. I plugged my antenna into an HDHomerun tuner, which allowed my Windows PC to record two HDTV channels at the same time. To get everything working in the Toronto area, I simply told Media Center that I live in the United States at Zipcode 14174 (for other areas of Canada the setup is a bit more involved). The steps above turn the PC into a PVR that’s quite frankly better than any PVR from the cable company. When you have both an XBox 360 and a Windows Media Center PC in the same house, it turns the XBox into a PVR too! Microsoft calls this a Media Center Extender, I have three extenders in my house which means that every TV in the house is a high definition PVR. 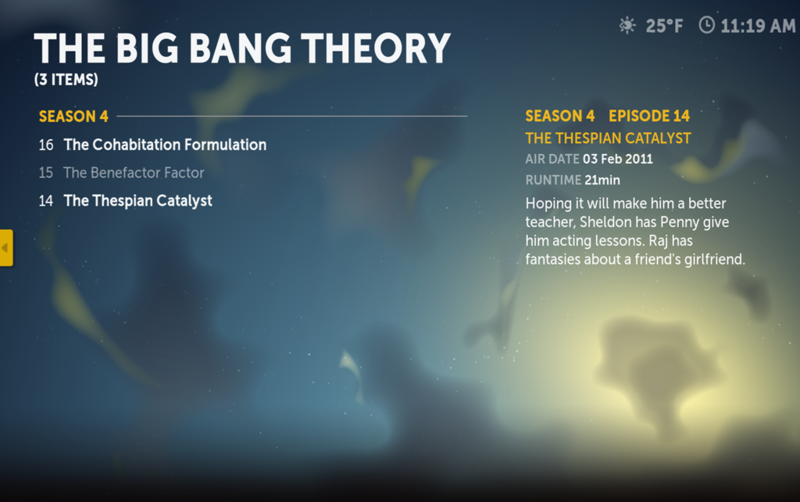 Surprisingly, there is very little content on broadcast television for kids these days. However, kids programming is an area where Netflix really shines. I picked up an Apple TV 2 for about one hundred dollars and plugged it in to the TV in the basement. I taught my eight-year old how to use it in about ten minutes, my six-year old still needs a bit of help getting it going. Netflix is now the kids’ primary source of content, and since they’re using my account I can monitor everything that they watch. So there we have it, Cable TV has been completely replaced in our household! Flush with an extra $60 per month in cash, I find myself a bit more liberal with the entertainment dollar. I spent an extra $30 to buy simple.tv, which takes everything from my PVR and syncs it to my iPod for business trips. I bought the entire Scooby Doo box set for about $60 and added it to our DVD collection. We rent HD movies on the XBox for family movie nights. My daughter watches Netflix in her room on an iPod Touch. Overall I’m spending less and getting more for my entertainment dollar. I count that as a win! This setup works well for my family, but there’s one key difference between my house and most other Canadian households… we don’t really care too much about live sports. I get all the games I care about including the Stanley Cup, Superbowl (with US commercials! ), World Series, and the Olympics. However if you spend most of your time on TSN or Sportsnet then what I’ve done probably won’t work for you. I am not aware of any legal way to get those live sports other than cable or satellite. The Digital Home Canada forums are a great place to ask questions and dig in to some more options for cutting the cable. While I would recommend doing a little research to see what’s best for you, I know the reality is that many will just want to know what I’ve got so they can go buy the same thing. Here’s the full list of what is involved in my setup. It’s back-to-school time, and across the country students are packing up their stuff to settle into a dorm room for the next ten months. Having lived in a university dormitory for four years myself, I know that getting TV into your room is always top of mind on move-in day. Until recently it was a futile effort in most schools, but this year things are different. Starting September 1, the airwaves surrounding our country’s colleges and universities will be overflowing with free high-definition digital TV. You’ll need an antenna to pull in these signals, and based on research I recommend the Terk HDTVa for your dorm-room window. You can simply plug the antenna into a small HDTV and you’re good to go. However, since you likely already have a laptop in the dorm room you might want to use that instead. For a Windows laptop, I’d recommend going completely wireless with the HDHomerun3 tuner and a fast 802.11N wifi router. Once you’ve got the tuner set up, you can use Windows Media Center (included in Windows 7) to watch Live TV or Record TV using the PVR functionality. If you’re running a Mac, you can get the same tuner bundled with the EyeTV software which also lets you watch TV on your iPhone. For a little less money, the Hauppauge 950Q is a well-regarded and tiny USB tuner. See the table at the bottom of the article for what you can expect to receive from your dorm room at some of the schools around the country. Most of the major Canadian networks make their primetime shows available on the Internet. Quality isn’t nearly as good as you’ll get over the air but you can’t beat the convenience (assuming your dorm-room connection is fast enough for streaming video). While you can go to each of their individual websites, I recommend using an app called Boxee. 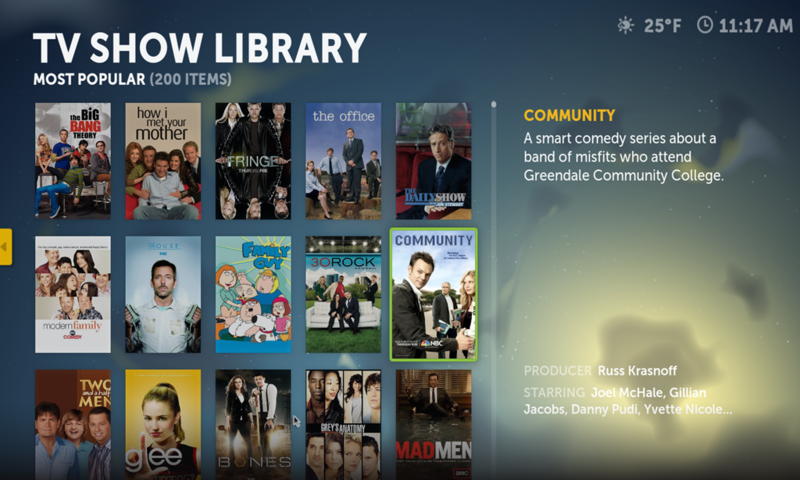 With Boxee, you get all of the shows nicely organized like an Internet PVR without all the clicking. You can install Boxee on your laptop or if you can get a little Boxee Box to plug in to your TV. When I was working in the dorms, the game was trying to steal cable from the lounge (which never worked BTW, at least not on my watch). With the availability of Over-The-Air high definition TV and Internet TV there’s no reason to run afoul of your RA’s wire cutters any more. 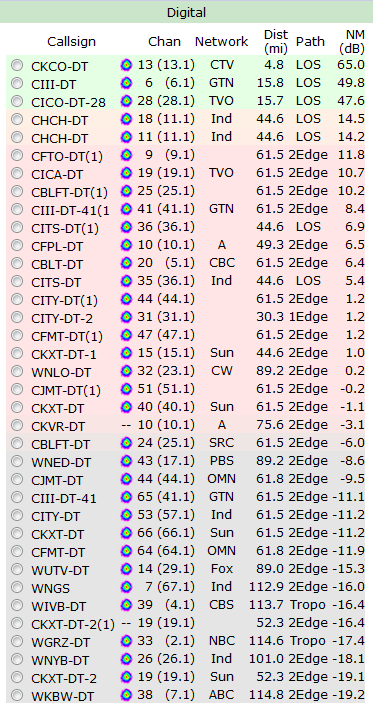 The table below summarizes the channels you can expect to get with an indoor antenna at the more prominent (according to Macleans) schools across the country. You can always check your exact address at tvfool.com to get a more detailed report. News reports, advertisements, and telemarketers are operating at full speed with the transition from analog to digital TV transmission just a couple of days away. The misinformation is driving me absolutely nuts, so I wanted to take a minute to clear up some myths I’ve been hearing. Fact: There has never been a better time to get your TV by antenna. 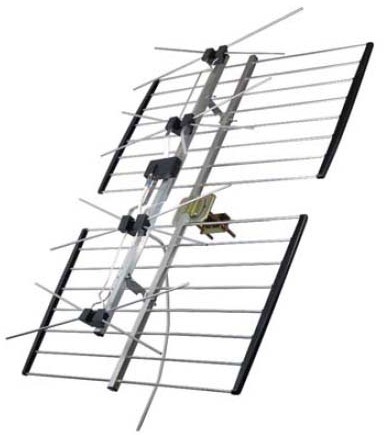 The majority of Canadians can get the majority of their TV programming for free using an antenna. Toronto residents can expect to get 25+ channels of digital TV from all the major networks, 30+ in Montreal, 15+ in Vancouver, and the list goes on. Fact: Many cable companies are choosing to switch entirely to digital, but that is entirely their choice and has nothing to do with the over-the-air switch or government mandates. The digital switch is a good-news story, and an opportunity for Canadians to re-think that $100 (or more) cable bill now that most of the TV they watch is available in high-definition for free. I’ve written additional in-depth articles that will help you determine what channels you can get at your home, and some instructions on how to install your own antenna for less than what some people pay for one month of cable. I’ve noticed this week that there are plenty of unscrupulous telemarketers, uninformed salesmen, and headline-seeking news outlets who are using this digital transition to serve a different agenda. For just the raw facts, the Government of Canada’s digital transition website is the place to go. Enjoy the new world of HDTV coming to Canada, I know I will! On August 31 2011, the Canadian airwaves will light up with new free HDTV signals from your local television stations. In order to take advantage of these signals you’ll want a good quality antenna to pull in the signals. 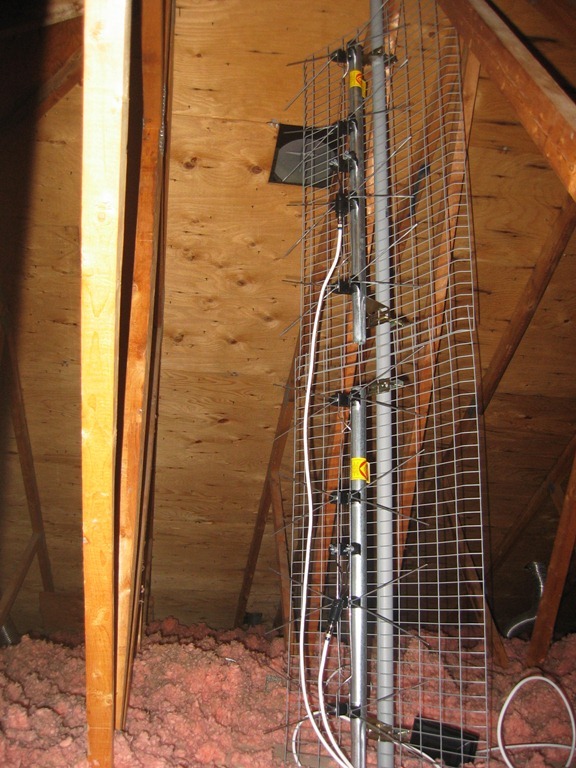 The next best thing to an outdoor antenna is to install an antenna in your attic, which is actually quite easy to do. I’ll walk you through the basics. See the chart over at Digital Home Canada for the latest recommendations. The Winegard AP-4700 was my choice as I didn’t want to over-amplify the signal and at the time I only needed UHF channels 14 and up. Find a spot in the attic that is relatively easy to access. Use conduit clamps (also at Home Depot) to mount the pole vertically between rafters. Use a level to ensure the pole is straight. Mount the antenna to the pole following the manufacturer’s instructions, as high as is possible. The CM4221 is a simple U-bolt that you loosen via a couple of nuts. Figure out how you’re going to run a cable from your antenna to its ultimate destination (likely the TV). Found a cold-air return duct that ran from the ceiling of the top floor all the way down to the basement. In the attic, use electrical tape to attach the coax cable to the coat hanger, then pulled it through into the duct. Back in the basement, connect the long coax to the power supply that came with the preamp. Connect another length of coax from the preamp power supply to a splitter, and ultimately to the TVs you wish to connect (you can probably re-use the cables already in your home that were put there for Cable TV). Using maps on TVFool, figure out in which direction the TV stations are broadcasting from, and point your antenna in that general direction. The next set of steps is mostly trial and error, and you’ll likely need a helper. 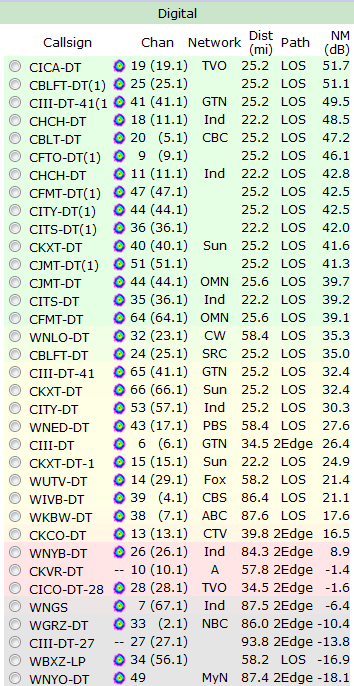 Pick one of the channels from your TVFool report that is relatively low on the list, we’re going to try to point the antenna optimally to bring in that hard-to-get channel. Tune your HDTV to that channel (you may have to run a channel scan first), and set the TV to signal strength mode. Try adjusting the antenna left or right until you get the best signal strength. Once you’ve got that hard-to-get channel working, check the signal strength on the other channels to ensure they’re coming in strong. If not, you may have to keep tweaking until you find a happy medium for all the channels. That’s about it, you should now have access to all of the free HDTV signals that are flying through the air here in Canada. I’ve included a couple photos below of my setup to help you visualize. 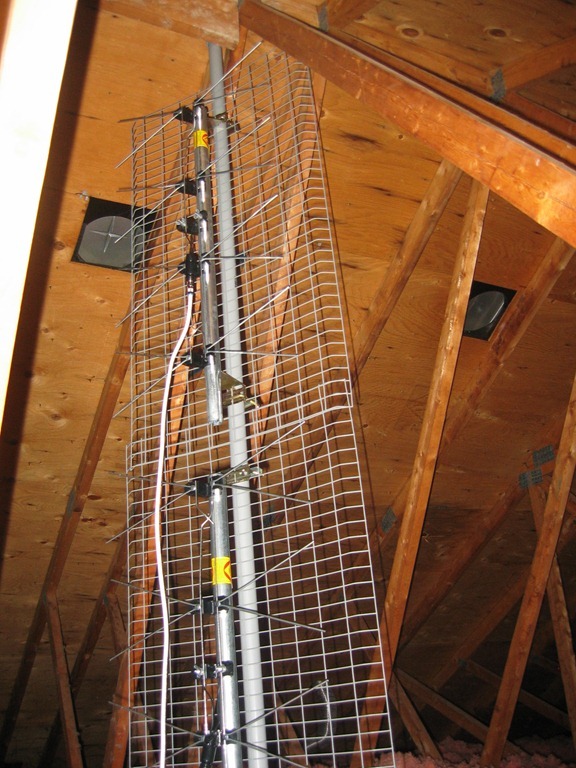 You may notice that I actually chose to stack two Channel Master 4221 antennas in the attic, which helps me to pull in some of the more challenging channels from Buffalo. Following years of dutifully paying our cable and satellite bills, most Canadians have forgotten that TV in this country used to be free. Back in the good-old-days you’d pick up that nice wooden-cabinet television from Sears, extend the rabbit ears, and be good to go. Well those old TV signals are still flying around in the airwaves, but come the end of this month they’re all about to get a shot of 21st-century steroids that actually leapfrogs the HD quality that you’re getting from your cable company. Here’s a quick FAQ that will help you get started with the free digital TV in your area. The number of channels varies by your location, but there’s a great website that will let you know what you’ll be able to receive at your home. Click here and enter your address into TVFool, and on the next page choose “pending” to see what the world will look like on August 31. 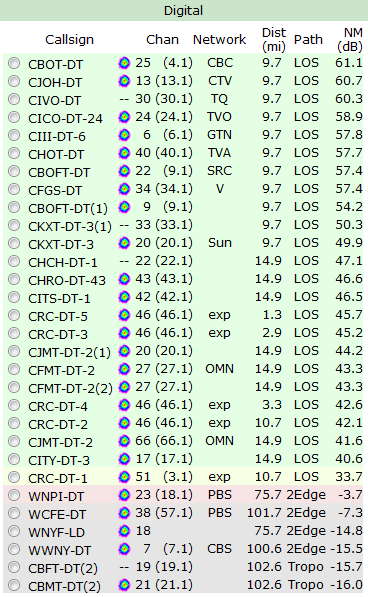 Everything in green you’ll get with rabbit ears, everything in yellow by putting an antenna in your attic, and if you’ve got an old antenna tower from the 70s still attached to the outside of your house then you can expect to get pretty much every channel on the list. Will it be all staticky like when I was a kid? No. With the switch to digital you either get the channel in full high-definition dolby digital glory, or you don’t get it at all. Why would I use an antenna instead of cable? The financial factor: Cable bills continue to rise, and many people will see this as an opportunity to re-evaluate whether you really need to pay $100 a month for TV service. In many cases you’ll get all the content you’d normally watch without a monthly fee. Picture quality: Cable and satellite companies compress the high-definition channels so that they can fit more channels into their lineup. Antenna channels are compressed as well, but not nearly as much and the quality is noticeable. Portability: The HD you get through your cable company is encrypted, and only works when connected to your cable box. Antenna channels are not encrypted, and can be recorded to a PVR , streamed around your house, or copied to your iPad to watch on the train. Yes. 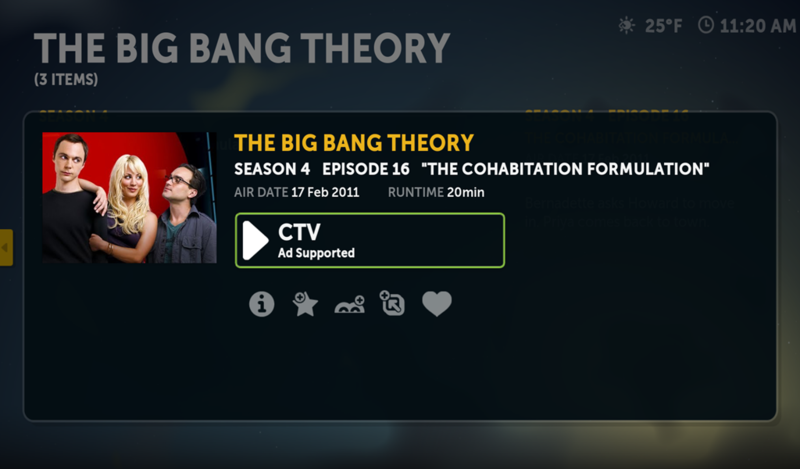 Television has been broadcast over the air for years, and this transition to free, over-the-air digital TV is mandated by the Canadian government. Ok I’m sold, what do I need? Pretty much every HDTV sold since 2005 has included a digital tuner (called an ATSC tuner), so all you need to do is plug an antenna into your TV. To try things out, you could get a small indoor antenna like this one and see what you get. Personally, I put a slightly larger antenna (about the size of a pizza-pizza box) in my attic. If you’re feeling handy, you can even build an excellent-quality antenna yourself. Really, is that what you do Pete? It really is as simple as plugging some rabbit ears into your HDTV, but as you probably gathered from that last answer there’s a ton of cool stuff you can do with this if you’re so inclined. If you want to learn more about how the sausage is made, I’d recommend checking out the OTA forums or the Home Theater PC forums at Digital Home Canada. If you just want to enjoy the tasty free sausage, there’s nothing to lose by picking up a little antenna from your local electronics store and plugging it in to your TV. Keep the receipt, you can always take it back if it’s not for you.